Many people simply assume that with old age comes a natural loss of memory. 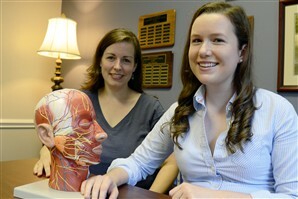 The truth, however, is more nuanced, and Elon University senior Ruth Robbins is using the school’s top prize for undergraduate research and creative achievement to investigate how particular mental exercises can help older adults keep their memories longer in the march against age. Robbins is exploring a method known as cognitive intervention with members of the local community. Her undergraduate research is the first to be featured this fall in a series of E-net profiles on Lumen Scholars in the Class of 2012. A psychology major from Los Angeles, Robbins has spent two years investigating the effect of cognitive intervention on memory loss in geriatric populations. Cognitive interventions challenge individuals with specific impairments, such as memory loss, to engage in activities that are difficult due that impairment. With help from her Lumen Prize mentor, assistant professor Amy Overman in the Department of Psychology, Robbins established the “Aging Academy,” a 10-week program that uses specialized forms of game-play to sharpen elderly adults’ working and long-term memory. Robbins said that a lack of research in cognitive intervention for elderly populations, the present aging of baby boomers and, on a personal note, her relationship with her grandfather, made the decision to explore memory loss an easy one. The close relationship with her grandparents motivates the one-time North Carolina native in her own academic pursuits to promote healthy memory for the growing population of elders. With several classmates, Robbins has been meeting elderly research participants each week to conduct games that involve recalling a series of playing cards. The games are based on recent findings from laboratory research, which suggest that specific training tasks can improve general cognitive abilities. Until now, no research has attempted to apply those methods to older adults in a community-based setting. During the 2011 spring semester, she organized an “Aging Academy” with elderly individuals at the Friendship Adult Day Center in Burlington, N.C., and she is currently completing the program with a group of 17 adults from Mount Zion Baptist Church in Greensboro, N.C.
A major goal for her research is to leave a legacy, “sharing this knowledge that memory doesn’t have to decline, showing how to do that and what cognitive intervention means,” she said.” She says she hopes that students will continue the work she has started with the academy and maintain the partnerships that she’s formed with community organizations. The Lumen Prize, awarded for the first time in 2008, provides selected students with a $15,000 scholarship to support and celebrate their academic and creative achievements. Lumen Scholars work closely with faculty mentors to pursue and complete their projects. Efforts include course work, study abroad, research both on campus and abroad as well as during the regular academic year and summers, internships locally and abroad, program development, and creative productions and performances. In addition to her undergraduate research, Robbins is vice president of the Phi Eta Sigma and Phi Kappa Phi academic honor societies, is involved with Psi Chi and Omicron Delta Kappa, and works as the resident area coordinator for West Area. She has also served as a teaching assistant for the Life Entrepreneurs class. *Originally published on Elon University’s E-Net, Oct. 4, 2011.